SQL Server interview questions: - Elaborate architecture of Notification Services? This is the SQL Server interview questions which more of Database administrator (DBA) oriented. Have a look before going for interview. So one can start answering this question as follows. Notification Service application: - It’s a simple user application which will be used to add subscription to the subscription database. Event providers: - All events reside in Event providers. There are two event providers which are provided by default “File System watcher” and “SQL Server event provider”. “File System watcher” detects changes in operating system files. “SQL Server event provider” watches for SQL Server or analysis service database for change. You can also plug in custom event providers. When event providers find any change in database, they send the event in “Event” table. Generator: - Generator checks the event database, when it finds any event it tries to match with the subscription and sends it to the notification database. So generator in short is the decision maker between the subscribers and the events. Distributor: - Distributor continuously pools the “Notification” database for any “Notification’s” to be processed. If the distributor finds any entry, it retrieves it and formats it so that it can be delivered to the end recipient. Formatting is normally done using “XML” and “XSLT” for rendering purpose. 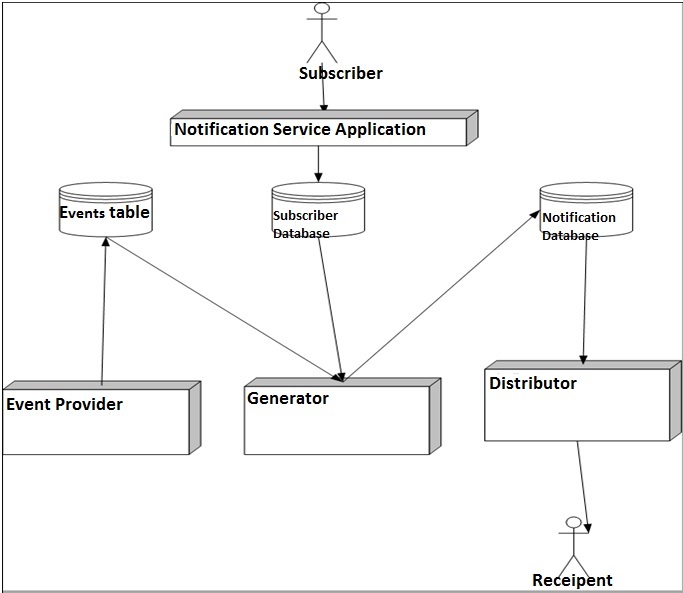 Figure: - Detail architecture of SQL notification services.